Settled right within the heart of North Dakota is one of the most beautiful state parks in the United States. 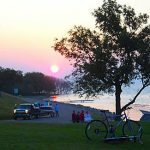 Grahams Island State Park on Devils Lake in central North Dakota has it all, offering visitors a little taste of everything. Grahams Island State Park is located near the center of North Dakota, roughly two hour’s drive from both Minot and Grand Forks, two of the largest cities in the state. The nearest population center is the City of Devils Lake, a 10 mile drive east of the park. Grahams Island State Park is just that, an island. The park is located on Devils Lake and contains 1,142 acres of space for camping, hiking, fishing, and boating. Devils Lake itself is the largest natural lake in the state of North Dakota, meaning there is ample space for boating and fishing in particular at Grahams Island State Park. The region is known as a closed drainage basin, resulting in fluctuating water levels on Devil’s Lake. Water levels in the lake surrounding Grahams Island State Park have risen 25 feet over the last 10 years. Located in the middle of Devils Lake, visitors to Grahams Island State Park can reach the park via a bridge embankment that is connected to the mainland. Just getting to the island can be dangerous as motorists must exercise extreme caution crossing the bridge as high winds make the trek dangerous. Because of the park’s location on Devils Lake, fishing is the number one attraction for visitors to Grahams Island State Park. With a boat launch onsite, visitors can head out onto Devils Lake in search of fish, or cast off from the shores of the island in search of shallow water fish. It doesn’t need to be the middle of summer though, as northern residents are just as fond of ice fishing as they are of fishing from a boat in the summer months. Fishing is a year round attraction at Grahams Island State Park. Grahams Island State Park is a little slice of heaven in the middle of Devils Lake. For more information about the park and its history, or to make reservations, visit the North Dakota parks website at www.parkrec.nd.gov. Whether you are looking for a relaxing fishing trip or a weeklong break from the hassle of everyday life, Grahams Island has what you are looking for!